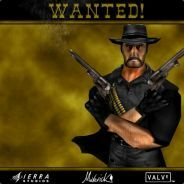 Portal » Board index ‹ Zábava (Entertainment) ‹ PC Hry (Klasiky Starej Školy) ‹ Half-Life & MODS ‹ Wanted! Wanted! je modifikácia hry Half-Life, vytvorená štúdiom Maverick Developments vo Veľkej Británii. Obsahuje hru pre jedného hráča aj hru pre viacerých hráčov. Hra je situovaná do čias amerického Divokéhu Západu. Dovedie Vás ku horským Indiánom, mexickým dedinčanom či Americkým starousadlíkom. WANTED! is a total conversion of Valve Software’s Half-Life produced by Maverick Developments in the United Kingdom. Wanted! is a single player and a multi player game. The theme of Wanted! is set in the American Wild West. It spans the Mountain Indian, Mexican villas and the Western town appearance. Wanted! is not designed to be representative of any specific period of the American Wild West. It is designed to be a fun gaming experience in the style of the West in its total era. 4 different races to battle: Indian, Mexican, Cowboy & Miner.